I came across a report this weekend — no, not that report — that ethics and compliance professionals might want to contemplate. It was a news report about a spokesman for the Federal Highway Administration, who has said offensive things on Twitter. The tweets came from one Doug Hecox, your standard-issue government functionary whom almost nobody has ever heard of. Hecox has been a spokesman for the FHA since 2004. In his spare time, Hecox has also been a writer, teacher, and supposed comedian. You get the idea. Hecox has tweeted many more tasteless things that we don’t need to review here. We do need to ponder an increasingly common question. What should organizations do with employees who have said offensive things in the past? Hecox is only the latest example. We also have Tucker Carlson, Fox News host and a fountain of stupid statements. He’s been in trouble lately for racist and bigoted statements he made a decade ago when he was a regular guest on a talk radio show hosted by Bubba the Love Sponge. I’m sure you’ve encountered other examples. They span all genders, ages, political views. Compliance officers might naturally wonder: isn’t this an HR issue? Yes, but only at the most cursory level. HR people want to know whether an employee has violated a company policy, and what to do about that. The policies themselves come from the legal and compliance teams. Policies reflect what the law requires a company to do, or what corporate values drive a company to do. And that’s why this problem of stupid stuff on social media enters the ethics & compliance realm. Hecox, Carlson, and all the others intrigue me because they exemplify a point we’ve explored here before: that social media isn’t a risk unto itself, but rather, magnifies all the risks you already have. For example, we’ve all said stupid and offensive things. People have said stupid and offensive things since time immemorial. Social media, however, magnifies the ability to document and disseminate those stupid things more than any other medium man has built before. Sometimes individuals document and disseminate their own stupid statements; that’s what Hecox did with his bad jokes. Sometimes other parties document and disseminate your stupid statements; that’s what a media watchdog group did to Carlson. Either way, the magnifying effect is there. Which brings us to our next point. Social media also magnifies the ability of like-minded people to find each other. Sometimes that’s a good thing: Facebook groups for cancer survivors, Twitter lists of leading thinkers or corporate compliance. Many times it’s a harmless thing: people kvetching about delays on the subway ride home, or sharing memes of cats. And sometimes it’s a dangerous thing: gullible voters falling for Russian fake news posts to elect President Trump. Regardless, social media is a powerful thing, that lets disparate parties form alliances to pursue a goal more effectively. The collision of those two forces is what gives a company so much grief. Social media allows people to find instances of employees saying stupid things more easily; and it allows people to form online posses that pressure the company to deal with the employee the way they want — which might quite different than what the company and employee want. Then the company is confronted with a choice. Are we the sort of company that punishes people for a stupid statement that possibly happened long ago? Are we the sort of company that tolerates people perceived as jerks or hate-mongers in our midst? That choice will be interpreted as a reflection of the company’s values. So yet again, we’re back to ethics and compliance. All of these social media blowups underline another issue we’ve explored before: the difference between values and priorities. Values are easy to state: every company values integrity, innovation, respect, collaboration, and so forth. Those values are in every break room in Corporate America. Priorities are which tasks the company wants to accomplish first: holding people accountable, fostering a climate of free discussion, serving the customer, making a profit goal. You have to rank them. You have to put one first. 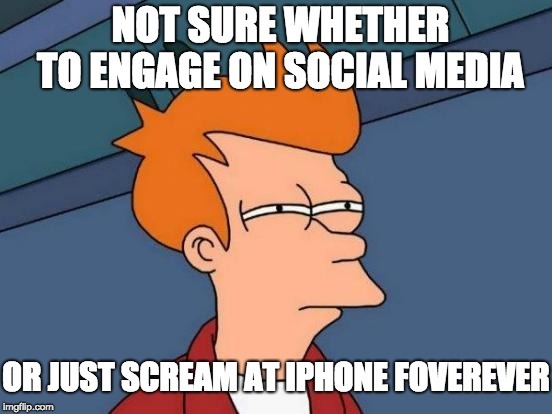 That’s the tension that social media is dragging out. It allows others to challenge a company’s interpretation of its values and priorities more aggressively. Our deeply polarized society, which seems unlikely to change any time soon, only makes matters worse. That is, for every conservative employee who feels that his ability to speak freely — even off the clock, on his own personal social media page — is now threatened, there is a Latino or Muslim worried that said coworker is a budding radical conservative terrorist preparing a shooting spree, or a female coworker wondering whether he’ll harass her. Which employee should the company support? That will depend on the company’s values and priorities. Just have no illusions that whatever decision your company makes, it risks coming under fierce fire — because social media has magnified every offense, and every response to it. It’s a messy situation, not necessarily fair or even right. It is, however, how the world actually works today.